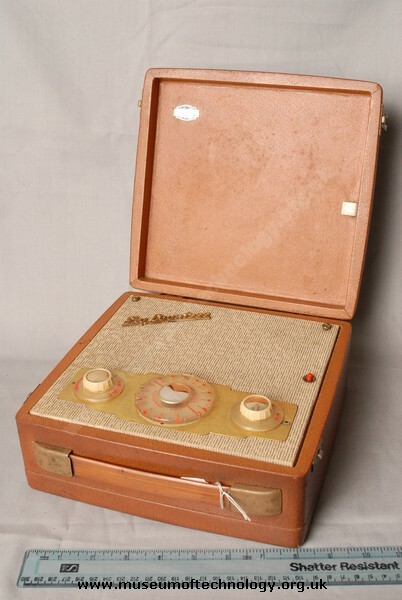 The Ever Ready "Sky Countess", is one of the last of the valve portables made by Ever Ready, in 1959 the 'Sky Captain' was made, which marked the switch to non-royal named transistors. Made in a wooden case with an on/off switch operated by the lid. It is a 2-band four valve Superhet operating from two batteries (HT and LT). Incorporating a Ferrite rod Arial and using a printed circuit board as the chassis. The valves used are DK96 - DF96 - DAF96 and DL96. The cost in 1958 was �10. My mother has just found her old radio from 50 years ago. She said that the old thing that she did not like was that she had to open the lid to allow it to play. The things I remember about it are that it had to face a certain direction to get a proper signal (due to the inbuilt aerial) and that one of the batteries it used, the 90 volt one, was fairly expensive and only lasted a relatively short length of time. It also used a 1.5 volt battery for the valve heaters.